Greg graduated from Victoria University in 1992 with a BA in Theatre and Film. During 1993 Greg trained as a Primary School teacher and in 1994 graduated with a Diploma in Secondary teaching from Christchurch College of Education. Greg has taught in secondary schools in New Zealand and England. He has taught comedy and improvisation throughout the country for 17 years at secondary and tertiary levels. 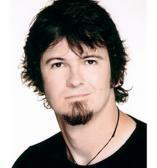 Since 1990 he has been involved with Wellington theatre company and corporate entertainment business, The Improvisors. He began as an 18 year old shareholder and has been the Artistic Director since 1996. He has also been involved in the establishment of Wellington actors’ agency – The ProActors. Recently he has been one of the founding members of the New Zealand Actors’ Guild. In his career he has helped set up and grow arts businesses and trusts. One of his great contributions has been in developing improv narrative shows for performance throughout the country. His improvisation performance has taken him around the country and overseas for the last 21 years and he has worked as a voice-over artist, film and television actor and as an MC at large corporate functions.